So, if you have never read an issue of Secret before (and considering it’s only on issue 2, there’s a good chance you haven’t) allow me to attempt and paint you a portrait. Take every good spy movie you’ve ever seen, combine it with the best organized crime movies you’ve ever seen, and throw in a little bit of corporate espionage. Stir, bring to a nice simmer and then throw on ice, and you have Secret. Even though we’re only two issues in, it feels like the story content of four issues of some series. It’s rated M, so it’s not for the little ones but all you’ll find inside are some violence and language issues. It’s perfect for fans of Hickman’s high concept stuff as well as those that enjoy spy thrillers. 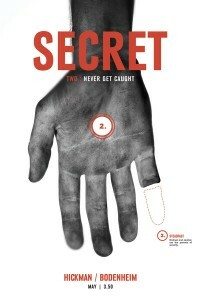 This entry was posted in JoeComicReviews and tagged hickman, image, secret by Joe. Bookmark the permalink. Jay Posted on It’s great to see heroclix back in busniess after all this time off. Next set is supposed to be released in Nov I believe.EVERY comic website I visit seems to have a feature on Chew seems I will have to try and pick it up when I can.